and loved ones that stop by. Nothing shouts “Happy Holidays” quite like a giant bow. 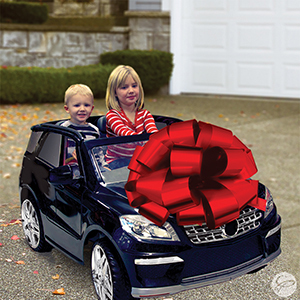 From decorating the front door to topping off a new car, it is one of the most iconic symbols of December. 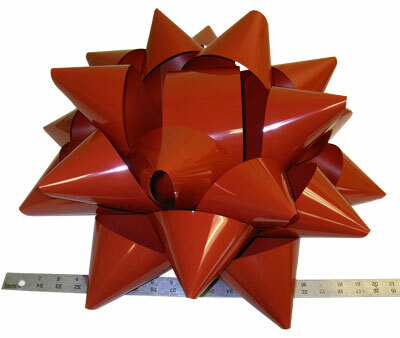 Available in 22 inches and 28 inches, this giant bow resembles the topper most associated with holiday presents, but in a super ginormous size. We suggest using these bows for automobiles, homes, your front door, garage doors, large presents, gates, store displays, props, and even holiday season ribbon cuttings. This bow has become a quick favorite with our customers, due to it not only shipping flat, but that we ship it for free! It comes in three sizes, 16”, 20”, and 24”, and come in a variety of colors to match your holiday theme. Crafted from 3.75-Inch wide ribbon with glossy lacquer finish; laminated on both sides for weather resistance. These are perfect for decorating stores, products, window displays, presents, large gifts, mailboxes, doors, rooms, buildings and more. These are the traditional holiday bows. Made from velvet and come in 6 loop, 8 loop, 10 loop, and 12 loop sizes. You may also change the size of the ribbon the bows are made from. Those sizes are 2 ½ Inch, 4 inch, 6 inch, and 8 inch. These weatherproof bows are perfect for adding that homey touch to wreaths, trees, lamp posts, mailboxes, fence posts, and more. Mad for plaid? Plaid reminds us of winter days and traditional Christmas celebrations. 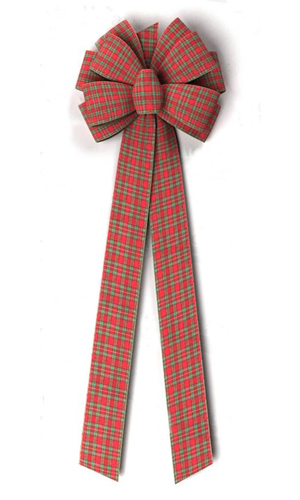 A holiday decorating trend that seems to be gaining steam is the tartan plaid bow. Our bow is made from 4 inch wired ribbon and the design colors are red and green. This bow has a width of 16 inches and tail length of 35 inches that gives an exquisite radiance to your decorating. We are hundreds of other plaid patterns and custom options, too. Just ask. 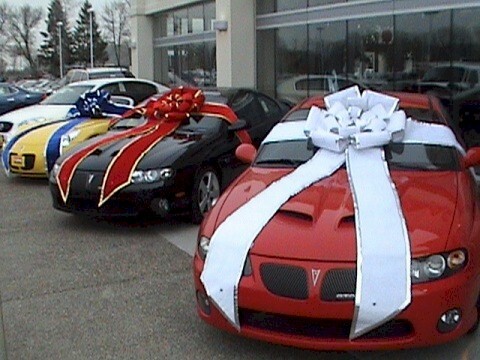 During the holidays, every car ad shows you beautiful bows on top of their new luxury cars. If you’re buying a loved one a big gift, or think those bows are a must for decorating your home, then look no further. 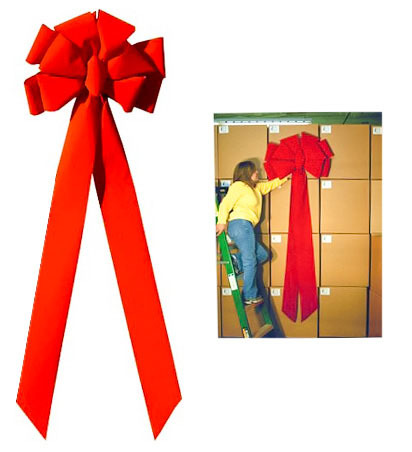 Our supersized 30-inch bows come in polyvinyl, satin bow, and red velvet styles. They come with a magnet on the back or a suction cup for easy application. They can also be customized. 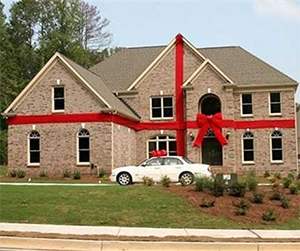 These red velvet building bows are made for easy commercial and large home scale decorating. They are ideal for malls, towns, airports, buildings, marquees, ribbon cuttings and large-scale holiday decorating. The 3-D bows come in solid red velvet (12 inch to 72 inch in size), red velvet with gold trim (12 inch to 72 inch in size), and there is the giant 8-foot bow available in both styles. We also have giant 60-inch solid colored bows in royal blue, gold, and silver. Custom orders can also be placed. We are sending an 8-foot bow to a nightclub this week. So now you can relax and celebrate Christmas in a larger than life way by ordering your oversized bows. There is no better way to prove to your family, friends, co-workers and neighbors that you have the most Christmas spirit! While these are only some of our most popular bows, we have many others that are different sizes and shapes that are perfect for the holidays or any occasion. If you don’t see what you are looking for, we can help, and we always beat or match any prices. You can call us at 1.800-378-3630 or write sales@goldenopenings.com. Make sure to look for the next installment of our Decorating for the Holidays Part 2 will be the guide to holiday ribbon.